but its the seasonal departures from that spongy condition that defines the Big Cypress Swamp. For example, during high water our swamp actually flows. That's unusual in the annals of half-water-half-land terrain. Usually wetlands are stagnant, or -- as in a riverine environment -- bystanders to faster moving water flowing by. The Big Cypress Swamp actually flows -- albeit infinitesimally slowly -- throughout its entire extent during the peak water climax months of late summer and fall. Then there is the example of low water. We tend not to think of wetlands going dry (like a desert), but that's what the Big Cypress Swamp does. Sometimes its desert state is caused by lack of rain, other times as an artifact of nearby drainage canals and levees, and usually the result of a combination of both. The above chart provides a historic summary of how long peak water (i.e. days of sheetflow) and desert-like low water (i.e. 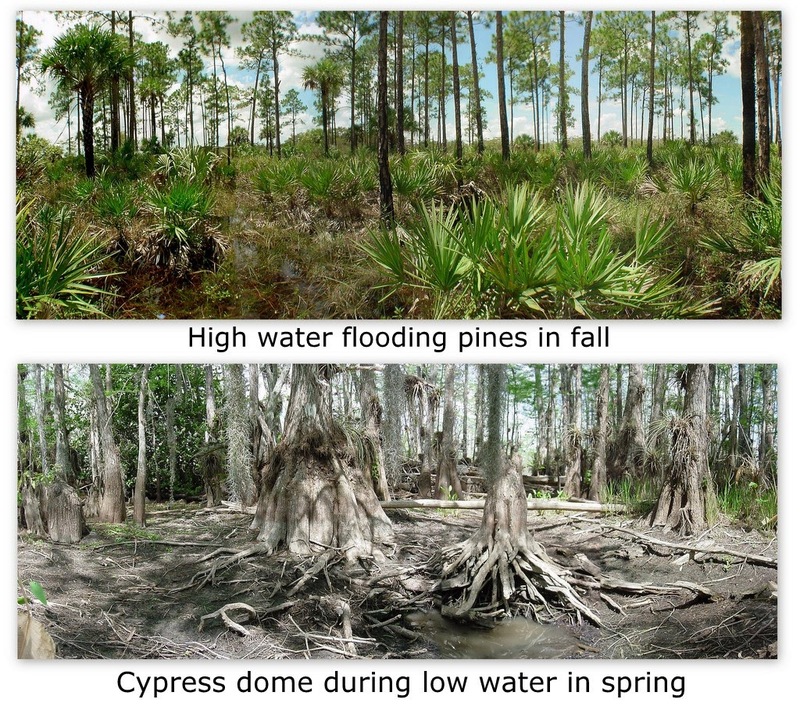 days of drought) have lasted in Big Cypress National Preserve, from 1993 to present. Our most recent wet season experienced 5.5 months in the peak water condition. That was about a 1.5 month longer duration than the long-term norm. This dry season has yet to drop down into drought mode yet, nor did last year's at this point in the dry season either, or barely even afterwards. Compare that to the epic-long drought spring of 2010-2011 when desert-like conditions persisted in Big Cypress National Preserve for 3.5 months. That's about 3 months longer than the long-term 19 day norm. A history of the swamps high and low range is provided above.